One commonality they shared, their love and passion for music!! Which was, for both of them, a natural heritage and not an imposed one!! Salil did come to Kishore- only to hand over some stray numbers in between in Awaaz, Parivaar and Musafir…The “Parivar” number “Kuvein mein kood ke mar jana” is still considered to be one of Kishore’s comic best! Kishore, also, by that time realizing that the industry was really not taking him seriously as a singer, focussed more on his acting( as a comic hero!!).. Well, much to his surprise, Kishore found a big fan following for his kind of acting also!! And by 1958, he was the most sought-after star after Dilip-Raj-Dev! 1970 – The year was good for both of them.. Kishore, after a long drought, got a big and ultimate hit in the form of Aradhana with which he was able to drive away everyone else from the top spot and acquire that most coveted place for him.. Salil, also, after quite some time, got a big place to showcase his talent in the form of “Anand” with superstar Rajesh Khanna… And Kishore, by that time, had already become the vice of RK!! But, the pair could still be not coupled!! Following a dispute with the movies director Hrishikesh Mukherjee( who originally comsidered Kishore as the lead role in Anand), Kishore went out of the project… That did not really bother Salil that much, I suppose, as his favourites Mukesh and Manna De delivered the goods for him.. But in 1971, that much awaited coupling happened… This time in a small budget movie of Gulzar called “Mere apne”.. By that time, Kishore had become so evident in the playback singing market, perhaps, Salil also did not want to stay out of it…. And they together created magic in the form of ” Koi Hota Jisko Apna”… Salil told after this song that it was the first time in 17 years that he realized how much potential Kishore had in his voice.. Well, that “natural sponteinity” to music of both of them were destined to meet, ain’t they?? But, there were differences… Kishore, known for his eccentricities, were not available many times Salil called him..
As a tribute to their creativity, the last magic they created called “Mone Pore Shei Sab Din”( Man Kare Yaad Woh din in Hindi) still takes us to the immortal memory of both these legends, who were like sorcereors’ stones, all the 30 times they came together, they stroke 24 carate GOLD! This entry was posted on Monday, April 20th, 2009 at 3:40 pm	and is filed under Kishore diary, Trivia. You can follow any responses to this entry through the RSS 2.0 feed. You can skip to the end and leave a response. Pinging is currently not allowed. Add to that, Kishoreda’s breathtaking voice and style!!! Isn’t that a lethal combination now? i wish people at this site would write more about kishore da rather than having comparisons. i met anil biswas’s daughter. she lives in delhi. her name is shikha biswas vohra. her tel no is 09811555570. Thank you so much,, By the way, what is Mrs. Vohra doing nowadays?? Anil Biswas was a class composer of his own!! I really admire his spirits as a music director- uncompromising, firm and uncommercialized,, He rather opted to step out of the industry than to dilute his music in the rat race..
A true music lover very identical to the spirits of Shree Pankaj Kumar Mallick or his brother-in-law Shree Panna Lal Ghosh!! its great how kishore finally impressed salil. my mother listened to those songs and said she loved them. I like salil chowdhry’s music and sad that kk couldnt sing with him in anand due to the touchy hrishi da dont u think so? Fav song is o sajna from salil.. it could have been a better combo than rd kk who were sometimes inconsistent imho..
Composers like Salilda, Madan Mohan etc. 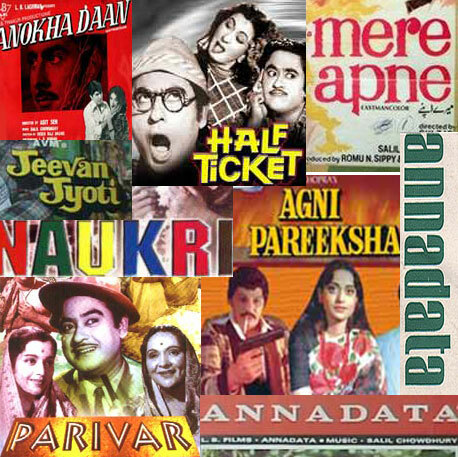 always remained “underrated” in this commercial industry of Hindi Cinema,, But they rule in the hearts of all the music lovers!!! Dear Arghya, can you please clarify that above line? Surely Kishore wasn’t disappointed with the compositions of Choti Si Baat, was he? That was an excellent by Salil Choudhury. And “Chhoti Si Baat” was indeed a great piece of work from Salilda,, In fact, all his works have fascinated me always,, Even his last movies like “Jeena Yahan” had superb motivational songs like “Hum nahi dukh se ghabrayenge” which we used to sing in the school in chorus..
ARGHYA,BROTHER THANKS FOR GIVING SUCH A GREAT PIECE OF INFORMATION TO US…THANK U VERY MUCH…..BUT I HAVE A QUESTION TO ASK TO U THAT KISHOREDA GAVE SOME BIG COMIC HITS TO THE BOLLYWOOD BUT WHY SUDDENLY HE CAME TO PLAYBACK SINGING…………..
And surprisingly, he got more appreciation in acting than singing!! so, he wholeheartedly switched over to acting until 1969, when the Burmans proved to the world again, what a great and versatile singer Kishore was!! That, in a very very brief nutshell, different transitions of Kishore’s career from singer to actor to again a singer!! Was great composition also sung by tremendusly by Abhas Kumar(Kishore Kumar). Also a great job done by both legendery masters. Kishoreda-Salilda combo is indeed one of the most versatile pair of all times in terms of quality of songs.In the film Aawaz,Kishoreda sang the song arra ram where he produced the voice of donkey.Kishoreda is the only singer who could produce voices of many other animals and many other pecuiliar sounds also,apart from his trademark world famous yoodling.I remember a famous bengali song of this pair from film Kabita where also Kishoreda had done the voices of many animals.That was an extremely tough song called suno suno go sobe.The combo worked for the first time in the film Naukri(Kishoreda was the hero)where guru sang 3 brilliant songs.Half Ticket is one of my fav films,Kishoreda entertained us brilliantly there and sang some great rhythmic songs for Salilda,including the historical aake sidhi where he sang in both voices because Lataji was not present to sing the female part.In Parivaar he sang kuven pe kudke which no other singer could have sung.In Musafir Kishoreda sang munna bada pyara for Salilda.In mere apne he sang one of the greatest songs of all times,the semi classical koi hota.Even Salilda was very impressed.The Kishore Kumar solo and duet in anokha dhan created ripples in the sea of music.And who can forget gujar jaye din from Annadat,an extremely togh and hit song.The song maujon ki doli from Jeevan Jyoti is also one of my fav songs.The song ranjhe ki ankhon is also a soothing number.Then came agniparikha and finally ankhri badla,where he sang the everlasting melody man kare yaad and a duet with Lataji,o mere sathi re.The bengali version of these 2 songs were eually hit songs.Both these 2 legends had given some of the greatest melodies working together. Very well written artcile. Going through the article what I could conclude is slight mismatch of compatibility between KK and Salil da. Other wise we could expect more gems from KK-Salil combo. I believe similar is the case between Rafi and Salil, hence we don’t see many songs from this combo as well. 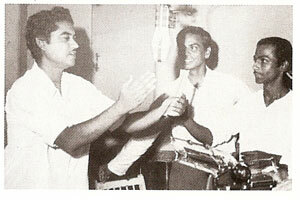 Perhaps Salil Da has used Lata and Mukesh maximum in his compositions. In the 50s and 60s Salil has used Talat also equally well. Thank you so much sir for your compliments.. As for Salilda, there was a uniform distribution of his numbers among male singers always and there was never a clear cut preference among male voice for him.. Mukesh sang 26 songs for Salilda, a few less than Kishore.. Maximum songs went to Manna De(62, including hindi and bengali and some malyalam also, i suppose).. 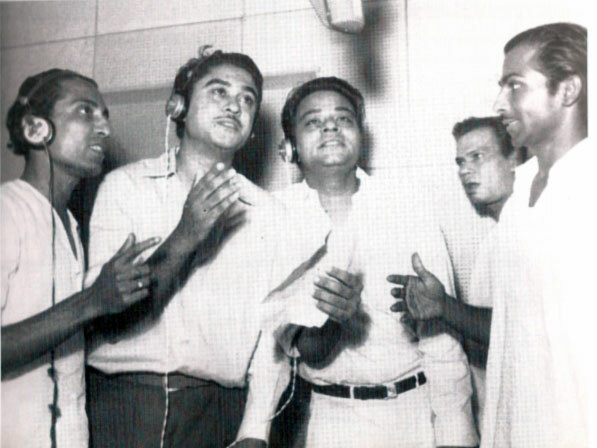 Manna sang 62, Hemant sang around 40(mainly bengali, around 20 of them), Kishore 30, Mukesh 26, Rafi 20 and later Yesu sang around 20 songs for Salil..
After going through the articles written by you , I must say tht you have the knowledge and depth about a man named Kishore Kumar . The name is just a Power House which generated the most top rated songs as ever . Till date we have not got any replica of our beloved Kishore Da , and we will never get also . We are in a close community and trying to take the community Called ” FANS OF KISHORE KUMAR GANGULY ” as far as possible . The full credit goes to you and I must say that , you are doing an excellent job . We , the “Fans Of Kishore Kumar Ganguly” will be with you always . Thanks a lot for such a nice article . I have considered myself one of the greatest fans of Kishore da but here i found that i have to know more about the great man and his songs. The Rabinder sangit,in particular is amazing and kishore’s voice makes it so special.My personal favourite since childhood is “chingari koi bhadke”. I think this is the best ever film song.Any way,can anybody tell me the opening lines and film name for a song having line as “naaraz koi na koi meharban…………,are baithun to nahi milti hai zamin main udna chahun hai door asman”. KK is the best singer. The song is “Jeena to hai par ae dil kahan”- as correctly mentioned by you.. Also, the MD is also Rahul Dev Burman.. The movie to which the song belongs is Daulat Ke Dushman(1981)..The first two line of the song has a typical resemblance with “Chand Mera Dil” whcih Pancham used a few years earlier in Hum Kisise Kam Nahi(1977), only the “meter” or the “pace” of the tune changed.. Listen both the songs carefully, you would find a great manifestation of a tune by another genius- R D Burman..
It’s a good article….Keep it up…We wanated to highlight more about KK with other music directors..specially from you. Chhota Sa Ghar Hoga Badalon Ki Chhaon Main …Is my personal favorite song of KK-SC..
mohabbat hogi..is superbly rendered with the utmost feelings by him.And just look at RIMZIM GIRE SAWAN,SULAG SULAG JAAYE MAN…! Lastly,this article comparing and showing their(with Salil da)association is very interesting. I KNOW NOT ANY GOD BESIDES EXPERIENCING SUCH CELEBRITIES IN THEIR RESPECTIVE FIELDS,BE IT ANY ! God manifests itself through such performers and gives us fuel to move on with the life with zeal! May God bless HIMSELF/HERSELF ! There is an unreleased Salil-Kishore song from the unreleased movie Zindagi Ek Jua.. The song is “Zindagi jua hai jeet haar kar ke jee le”..
Do listen.. It is a delight for all the fans of these two musical genius.. It is indeed a great piece of information about these two great musicians (a singer and a composer). Pl provide similar information about RD-KK combo, if you have. My Faourites Are – Koi Hota Jisko Aapna(MERE AAPNE),Mann Kare Yaad Woh Din(AKHRI BADLA)..Though Love All Songs Of This Combo. Well to answer yr question, I run a society in memory of my father Anilda and we just celebrate old music vide stage shows highlighting songs thematically. I am happy to say that thanx to us now film music is becoming immensely popular and much heard and frequently staged in the capital, the official keeper of the classical forms. Happily, my father it was who had immense faith in Kishoreda’s ability to render serious songs when many considered him to be a comic and non-serious singer. The songs he gave him to sing in Fareb are a testimony to that faith. Do write something about this if you can. We used to be neighbours in Juhu, by the way. Much has been writen about my father’s ‘antipathy’ to Mohd. Rafi which was overplayed in the media many years ago. However, baba utilised individual talent where he thought it appropriate and without prejudice. Most of the maestros of that time did too. The above incident is an instance in context. So it really is infuriating whn some fans blindly rave about the singers and criticise MDs. believe me, they knew what they were doing. Take warm regards from this little music lover.. Both in terms of age as well as knowledge, I am nowhere close to you and I take your compliments as a token to keep my energy to go on. I fel proud to get wishes from a family member of a legendary composer towards my endeavours. You are right about the reactions Rafians give to Anilji.. I, myself was an evidence in all those happenings, when me(a Rafi admirer as well as a Kishore fan), was there in http://www.mohdrafi.com, around a year back.. In fact, Mr. Binu Nair and a Sandeep Nadkarni’s comments on Anil babu and Salilda were the biggest reasons for me to step down from that forum and greatly abominate those people who term themselves as music lovers and I still stand by that decision of me..
We had a brief disussion yesterday, if you remember.. It would be a big pleasure from this small music lover, if we can continue sharing each others views. Hearty welcome to this forum and again a heartful of thanks for this privileage..
For the past 40 years I have been a great fan of Kishore Kumar who is probably the most talented singer the world has ever produced. Its unfortunate that international recognition to him is not as much as he deserves. If only Hindi was as well known as English the world over, he could have easily outshadowed Elvis Presley, Beatles and Michael Jackson. I also sing professionally and many of his numbers and have a huge collection of his songs–and have also diarised many of them alphabetically. Apart from that I love Neil Diamond and Engelbert songs. Grateful to you for such a valuable article. I was really looking for this. It was very unfortunate that these two greats did not produce more gems. It is very surprising that a person like Salil could not spot the talent in KK earlier which SD could. He used to make opportunities to get KK sing for him. Anyway, whatever these two greats have left, take us to another world. Thanks very much and request, pl. keep posting such articles.